Preheat the oven to 400 degrees F. Grease a miniature muffin tin (I used a tin with 12 cavities) and set aside. Use the muffin mix + 1/2 cup milk and follow the package directions to make miniature muffins. Bake, remove from the muffin tin, and allow to cool. In a small microwave safe bowl, melt the chocolate chips (or chopped chocolate) in bursts of 15 seconds stirring for 15 seconds in between each burst until the chocolate is completely melted. Dip the top of the whole almonds in the chocolate to create a "beak" for the turkey. Place the almond on a sheet of parchment paper and allow the chocolate to set-up. Scoop the remainder of your chocolate into a small plastic bag. Cut off the tip of the bag and set aside for a minute. 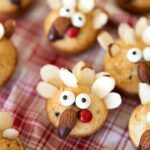 Position the sliced almonds on the back half of the muffins to create turkey feathers. Press each almond into the muffin. Using the bag filled with chocolate, pipe chocolate on to the back of the edible eyes and attach to the muffin. Hold long enough to let the chocolate harden. Pipe chocolate on the back of the almond beak and attach to the muffin. Pipe chocolate on the back of the miniature red candy and attach to the muffin. Press and hold the almond and candy in place until it hardens enough and stays put. Enjoy the muffins with 2-3 days storing them in an airtight container. *Make sure the bag of sliced almonds is big enough that you can be choosy with the almonds you use as a lot are broken up and don't look as pretty. **I find edible eyes in a craft store (baking aisle) or grocery store near cupcake liners, sprinkles, etc. on the baking aisle.